It's such an honor to get to interview, David Yazbek, one of my favorite composers who's also an Emmy award winning comedy writer for The Late Show with David Letterman. David wrote the music & lyrics to The Full Monty, Dirty Rotten Scoundrels, and Women on the Verge of a Nervous Breakdown. 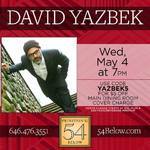 With five albums under his belt, David is now bestowing his talents on Feinstein's/54 Below for a one night only concert on Wednesday, May 4 at 7pm! Get ready to hear songs from David's work on Broadway, his albums, and Television!